A plantain to the untrained eye could easily be mistaken for a banana. It looks and smells like a banana, but if you ever bite into a raw plantain (plátano in Spanish), you’ll know it’s not. Plantains are bigger than bananas, harder to peel (especially when green), and cannot be eaten raw. They must be cooked for consumption. So, why are they so popular in Caribbean cuisine? Plantains are very versatile. They are always ready for cooking no matter what stage of ripeness - green, yellow, or black, and plantains are used in different dishes from appetizers to desserts. A plantain is a fruit but considered a vegetable. When green, they are bland and starchy, much like a yucca root or potato. Medium ripe plantains are yellow or yellow dappled with black, and they are slightly sweet. 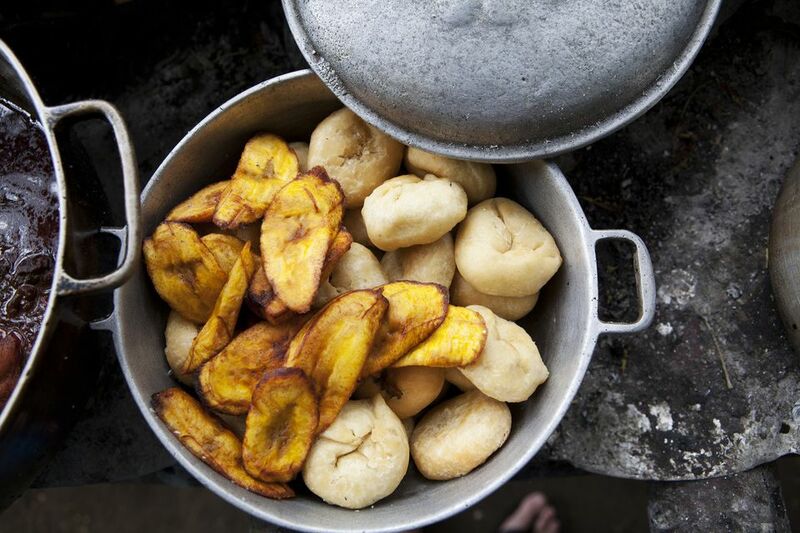 When the skins have turned almost black, the plantains are fully ripe, aromatic and sweet. Use a sharp knife to slit the skin from tip to tip. Peel under cold running water to keep your hands from becoming stained. Peel the skin sideways in one piece. Place the peeled fruit in salted water to keep it from discoloring before cooking. Plantains are widely available throughout the U.S. and can usually be found in the produce section of your local supermarket. At the grocery store, look for firm plantains. Avoid shriveled, squishy, or moldy fruit. You can ripen plantains by storing them at room temperature and out of direct sunlight. Turn them daily. It will take seven to ten days for green plantains to fully ripen. If you aren’t ready to use them when they’ve reached the desired stage of ripeness, you can peel and freeze them for up to three months. When plantains are still green, try preparing tostones or plantain chips seasoned with salt and pepper. They go well as a side dish with rice and beans. When fully ripened, prepare the plantains by baking them in their skins at 375 F for 45 to 50 minutes and serve them seasoned with salt, pepper, and a pat of butter. These jumbo cousins to the banana are good for you. Plantains are low in fat and sodium with no cholesterol. They're high in carbohydrates and are a great source of potassium, magnesium, fiber and vitamin C. A half-cup serving of cooked plantains contains about 80 calories.